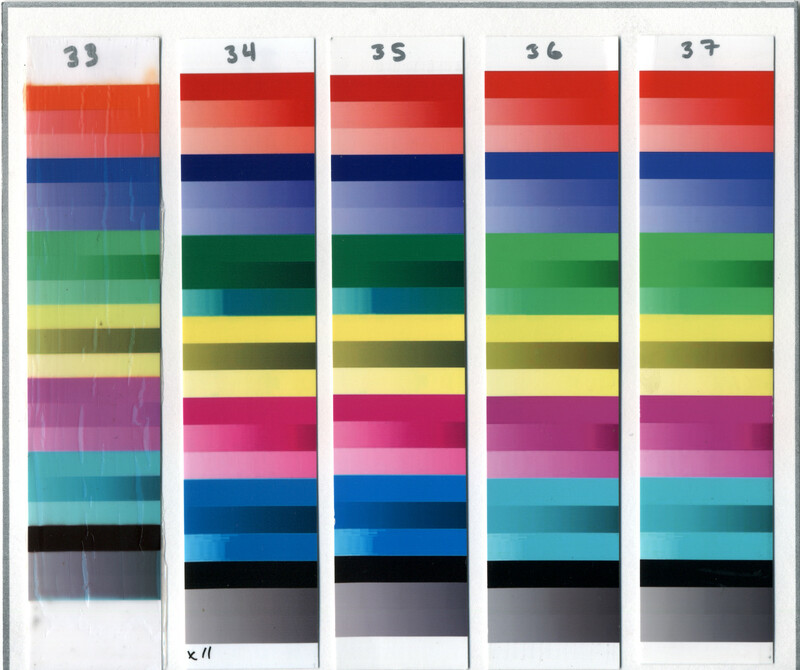 Dye-based inkjet inks are known to be susceptible to fading from Ozone. This is important because OZONE exists as both a natural and man-made pollutant and will react and fade the dye-based inks used by many consumers for inkjet printing. To get a better understanding of the effects of OZONE, we subjected various combinations of inkjet inks, papers, and protective coatings to this gas resulting in a total of 39 different combination tests. We hope that the results of these tests discussed below, will help to educate consumers about the negative effects that OZONE can have on print longevity.Other pollutants such as NOx, and SOx could not be tested on our samples due to the challenges of generating and handling such gases in a safe manner with our limited resources. OZONE may also produce negative health effects if inhaled. For this reason, we are unwilling to disclose the design of the equipment used in our tests.These OZONE tests are part of our overall tests, which also include fading tests from fluorescent lamps (UV/light). To read the UV/light fading tests and an overview of the entire project, click here. The overview provides additional testing details in addition to more specific information on our samples and how they were produced. 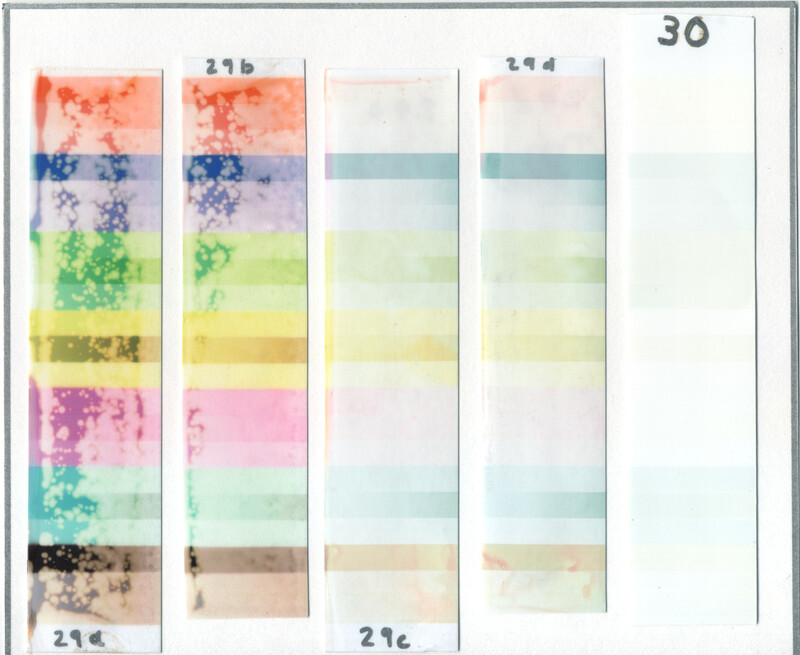 For the majority of OZONE tests, the test strips were adhered to heavy white paper sheets using a clear silicone adhesive applied in a thin film to the backing of each strip. This adhesive was chosen because it is very OZONE resistant therefore it does not react with the OZONE in the test enclosure. After a minimum 12-hour cure, the test strips were then placed in an enclosure containing an electric discharge OZONE generator. At specified test intervals, the strips were removed and digitally scanned, then placed back inside. The OZONE generator was then restarted and continued until the next test time was reached. Test times were recorded in the following sequence: 0, 30, 60, 90, 120, 180, 360, and 540 minutes. As you may notice, the intervals between scans start at 30 minutes but expand to 180 minutes on the last two. This is necessary in order to capture the effects on both the highly susceptible, and very resistant test strips.Ambient conditions consisted of near darkness, a relative humidity level of 30%-40%, and temperature of 20 –22 deg C. The strips were only exposed to significant light levels for the brief period during the digital scan. Commercial prints namely the Fuji Crystal Archive (FCA -Test 1), and Kodak (Test 2) suffered the effect of reversion, that is, the images re-intensified to some degree after sitting. This reversal was complete after 12 hours. This reversion effect required us to let the print rest 12 hours after each test interval before doing a scan. The level of OZONE within the enclosure could not be measured, however the focus of these tests is to show comparative results so there will be no extrapolating of fading rates to actual years of normal OZONE exposure. Now, since the images are being made available, an interested reader should feel free to analyze these and may wish to attempt to extrapolate their own “real-life” longevity estimates based on known reference fade rates. 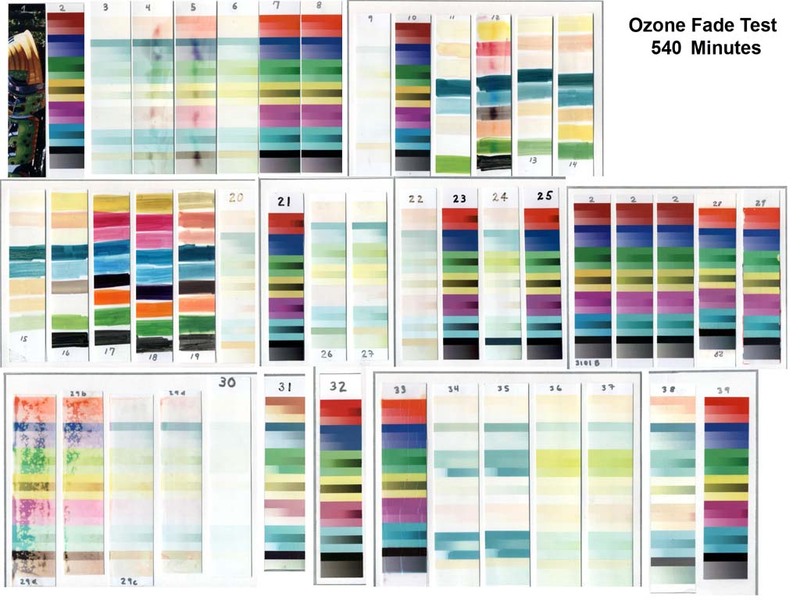 Such reference data may be found in the following Wilhelm Imaging article: Evaluating the Ozone Resistance of Inkjet Prints: Comparisons Between Two Types of Accelerated Ozone Tests and Ambient Air Exposure in a Home. This paper contains baseline data on fading of Canon BCI –6 inks on Canon Photo Paper Pro. This data may then be compared to Test 36. In addition to the ink/paper tests, the article provides ambient indoor OZONE levels for a house in Boston. 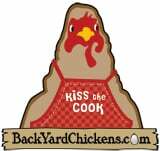 The following links provide all of our test image data for this combination. are not available and are represented as blank spaces in the animation. These were not needed because there was no apparent measurable fading. for each test time and then time lapsed into one pdf animation file. Scan_Images/ –Individual raw images. These are the actual scans of the test strips at each test time. Within the discussion below, direct web links to the test images will also be provided for convenience. The single most important factor in providing OZONE fade protection is the choice of print media when dye-based inks are utilized. With the proper choice of media, a great level of protection from OZONE is possible. Microporous coatings provide excellent image quality because the ink is absorbed into the coating almost instantaneously, not allowing it to spread or mix with other ink dots. These coatings also feel dry to the touch as soon as they are removed from the printer and are not smudged by water droplets. This porosity, although effective as an ink absorber, also allows atmospheric gases to be absorbed down into the ink itself. The result is an effect known as gas fading and is a major limitation of this technology. Gelatin is a swellable polymer and there are many others both natural and synthetic. When the water in the ink strikes the surface, the coating hydrates and swells as it absorbs the water in the ink. During this process the ink is also absorbed below the surface. Upon drying, the polymer shrinks back to its dried state and acts as a seal to keep out pollutants such as OZONE.You can quickly determine the coating type by how it feels. Microporous papers “squeak” when rubbed or scratched, while swellable polymer coating feel more like plastic and allow a finger to glide across with less friction. Illford Classic Pearl (ICP) (Tests 8, 39 –this is a composite view of all tests) showed excellent resistance to OZONE as did Kodak’s Ultima Picture Paper with Colorlast (Tests 7, 18, 21, 23, 25 -540 min). These two papers have swellable polymer coatings, which account for their high resistance. 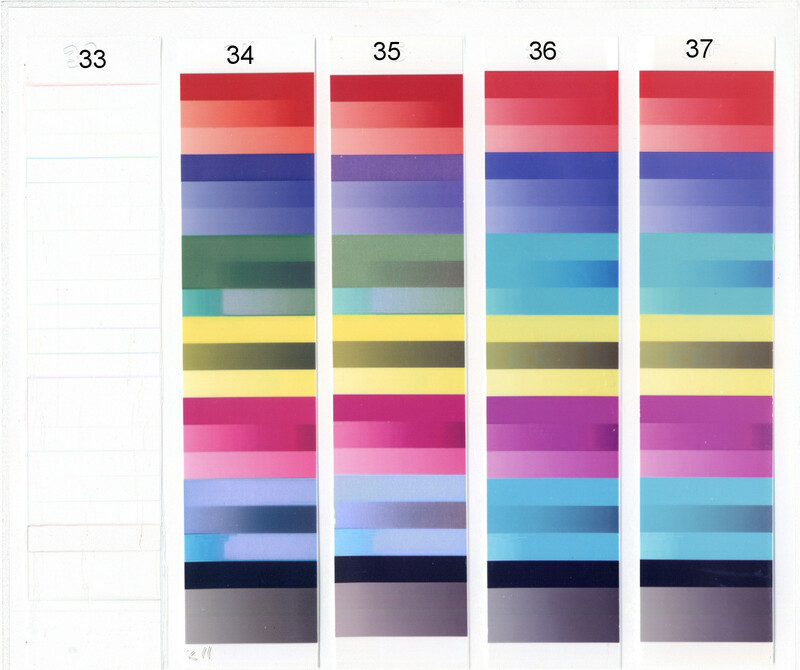 The Kodak Ultima paper actually has nine functional layers, however the ink-absorbing layer is of the swellable polymer type. For more information on the Ultima paper, see the Kodak Ultima white paper. 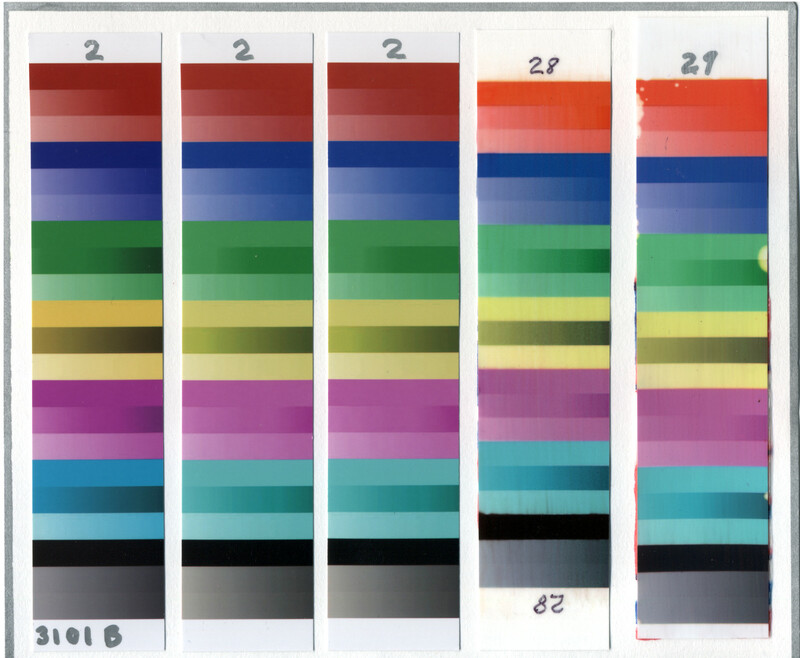 All other inkjet-based test strips printed with dye-based inks (excluding end-user applied coatings) showed significant fading, likely due to the majority (if not all) of the other paper coatings being microporous. Now, since manufacturers don’t always advertise the type, we cannot supply a confirmation. 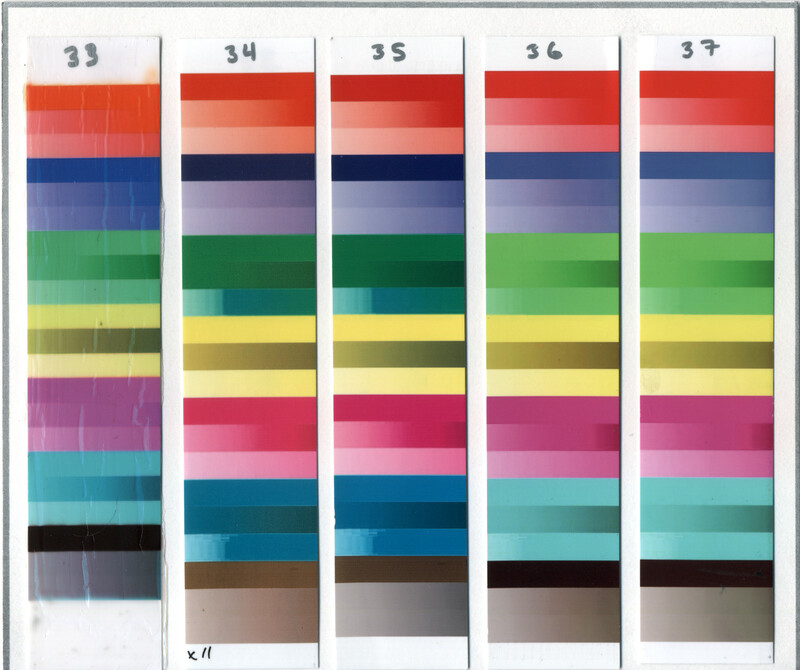 Dye-based inks showed the greatest susceptibility to fading when printed onto microporous papers. 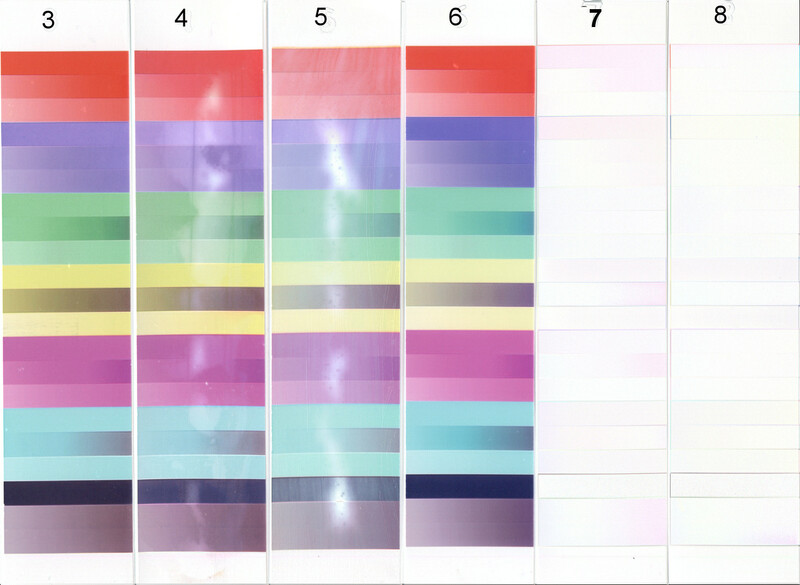 Tests 6, 20, 22, 24, 30, 34, are various OEM and third-party inks printed onto Kirkland 8/12 x 11 microporous paper. In these tests, the fading of third party inks is in some cases greater, and in others, less than OEM inks. Rather than try to describe all of the variability found between inks, it is more effective to just study the images for yourself. The greatest OZONE resistance of all inks tested was the Epson Ultrachrome/ Epson Premium Luster Photo Paper see Test 32-540 min. This ink showed the lowest degree of fading for a print made on microporous paper. Also, take a look at the difference image of Test 32 –540 min (diff). You will see that the fading is minimal and fairly evenly distributed between the ink colors. Framing under glass will provide significant protection from Ozone. There is a very detailed discussion in the pdf document “Protection of Works of Art From Atmospheric Ozone” from The Getty Conservation Institute. This document provides some detail on the protective effects of display cases and framing among much more comprehensive fading chemistry information. Although tests were performed on artist’s material, a discussion of OZONE levels in museum display cases versus the surrounding museum environment is informative. Referring to page 55, 56 of the Getty document, measurements within the cases showed a decrease in OZONE levels to 10-14% of the ambient room levels. 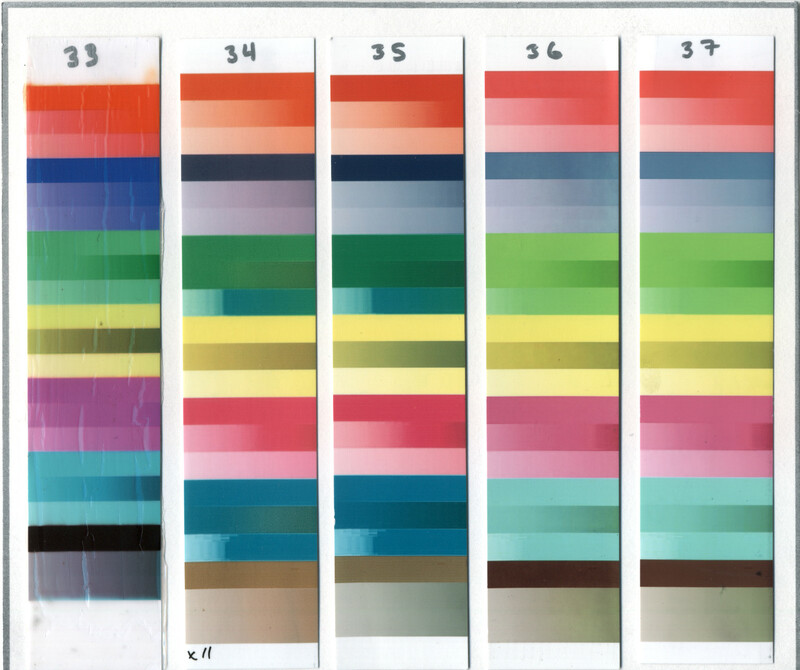 A measurement of OZONE levels under a glass frame was not made, however a test was performed on an Ozone sensitive Artist’s pigment framed under glass. The results showed a 41x reduction in fading with this particular pigment under a glass frame. A reasonably safe margin of longevity increase may be 10x for those framed under glass versus open-air exposure. We tested a protective coating called Clearshield (water-based acrylic). The coating was applied in tests of one, and two coats. It was also applied full strength, and diluted to 25%. At full strength (Test 29 -540 min), two coats provided excellent protection. Additional protection was also apparent on the swellable polymer papers of Kodak Ultima. See the difference images (note: diff images get lighter as fading is reduced) of Test 7-540 min diff image of Kodak Ultima without Clearshield, and Test 33 -540 min with Clearshield. Oddly, ICP paper did not show any improvement from the Clearshield- compare test 8 without Clearshield, and test 28 with Clearshield.When only one coat was applied (Test 29a -540 min), the protection was short lived and spotted. Diluted to 25%, (Tests 29b, 29c) the coating provided protection initially but was slowly lost as exposure continued. Even with the application of two coats, care must be taken to ensure that no areas are missed or any pinholes remain, especially when applied to microporous papers. If this is not done, eventual fading at these regions may result in a spotted appearance, which may look even less acceptable than an evenly faded photo (See the results from two coats with edges sealed in the Test 29 link above) We also confirmed in a separate unpublished supplemental test, that if all of the edges are not sealed, these regions will fade at a much faster rate than the rest of the image due to edge gas diffusion. The fading was apparent as far in as 1/8 inch from the edge after 540 minutes exposure. We also bent the test sheet to generate a fine crack in the coating. This crack showed fading similar to the effect of unsealed edges. Not apparent in the test results is the yellowing of papers after exposure to OZONE. We found that some of the papers yellowed after resting in the dark for several days after the OZONE exposure. The greatest yellowing occurred with the Kirkland microporous paper. These strips have taken on a “tan” colorcast. 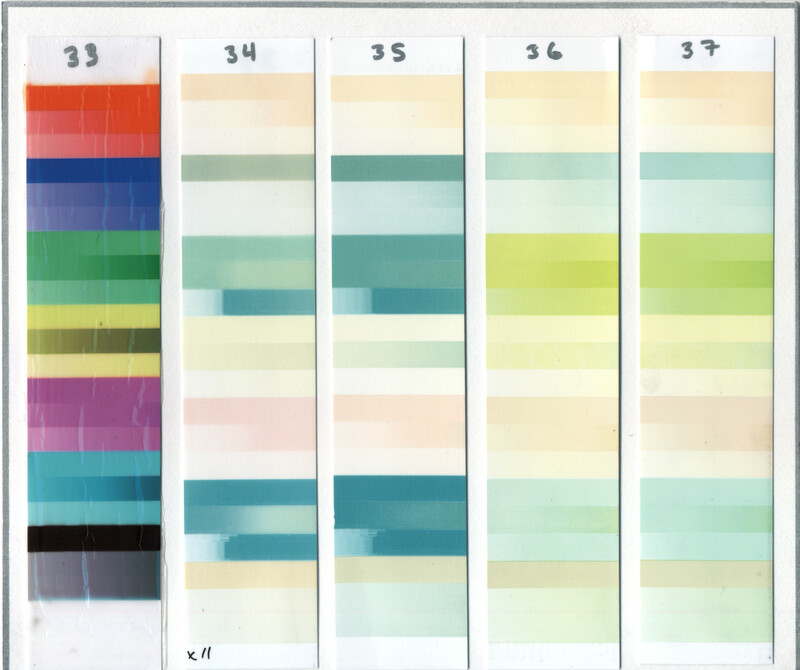 This result shows that it is not enough to use resistant pigment inks to ensure longevity, but in addition, the papers must also be non-yellowing after OZONE exposure. Clearshield effectively applied as two coats, full strength, did protect this paper from yellowing however any compromised areas of the coating will result in yellow spots with this paper. More than Just Fading –Will the Coating Survive? Another effect that may have an impact on print longevity is coating integrity. It was discovered that OZONE had a deleterious effect on the adhesion of some of the microporous coatings and can damage or destroy the adhesive properties. The eventual result may be a paper, which has a cracked coating, or worse yet, flaking off of parts of the coating. This may be of greatest concern when printing with pigment-based inks, which may be able to outlive the coating adhesive. Swellable polymer based papers are able to protect the adhesive from OZONE so they did not exhibit any obvious damage to the coating. An investigation into coating integrity would be a worthwhile pursuit since such testing information does not seem to be available. From the results, we have found that the paper coating type used, is the biggest contributing factor on the effect of OZONE for most types of inks. Exceptions are pigment-based inks, which have a much higher resistance. Since most people use dye-based inks, it is the paper choices, which will be the major determining factor for OZONE fade resistance. This is a fantastic article, with a lot of information that cannot be found elsewhere. Thank you for the work you’ve done on it. http://www.wilhelm-research.com also has some data on ozone resistance for many inkjet paper/ink combinations. The real question, I think, is “Where can ozone be found commonly in the environment (and can it be reduced?). The data above about framed prints and works under glass cases is also very interesting, and I wonder if plexi offers a similar protection from ozone. Many artists would like to display their work without glass, so I think that this is a very interesting topic for discussion. I know that I would like to just spray some fine art papers with a few coats of a solvent-based spray and display them (possibly mounted).